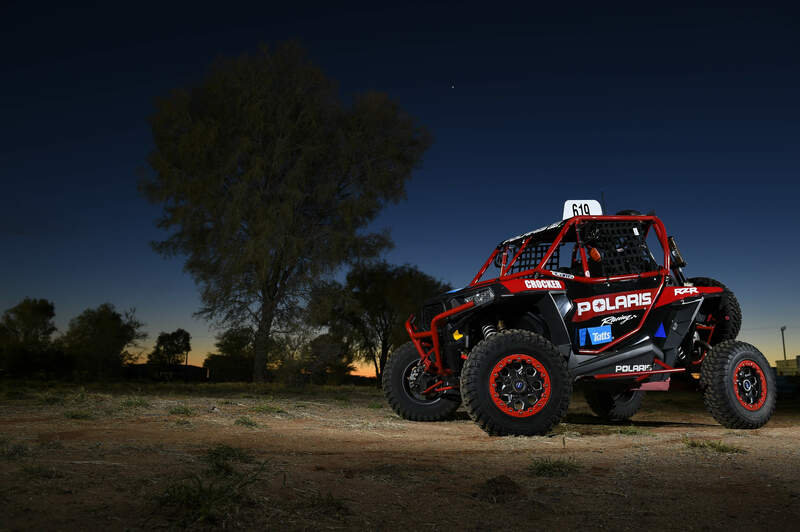 Polaris has dominated the entry list for this year's Finke Desert Race, arguably the world's toughest off-road race. Polaris RZRs make up 15 of the 25 vehicles confirmed to compete in the UTV class for the 2015 event. The annual race sees motorcycles and cars race for outright and class honours in a grueling non-stop 226km race from Alice Springs to the secluded outpost of Finke, originally a stop for the famous Ghan railway. The racetrack essentially follows the route of the old Ghan which ran through the centre of Australia from North to South before being moved further West. It's a punishing high-speed torture course of red sand and metre deep whoops destined to separate the tough from the ultra tough. The following day, finishers get to do it all over again in the race back to Alice with the winner determined by the overall best time. The UTV class is the most affordable production based class of the four-wheelers and has extended the racing careers of many former two-wheel competitors. Polaris has an enviable achievement in the race by not only winning the UTV class in 2014 but also being the first 5 vehicles to finish in the class. "We can't wait to get back to the Finke Desert Race. Last year we were the fastest back from Finke after some minor indiscretions on the way down", said 3 times Australian Rally Champion and 4 times Asia-Pacific Rally Champion, Polaris driver Cody Crocker, a first time visitor to the race in 2014. "This year our intention is to be the fastest in both directions. Bring it on". Polaris is a recognized leader in the powersports industry with annual 2014 sales of $4.5 billion. Polaris designs, engineers, manufactures and markets innovative, high quality off-road vehicles, including all-terrain vehicles (ATVs) and the Polaris RANGERÂ® and RZRÂ® side-by-side vehicles, snowmobiles, motorcycles and on-road electric/hybrid powered vehicles. Polaris is among the global sales leaders for both snowmobiles and off-road vehicles and has established a presence in the heavyweight cruiser and touring motorcycle market with the VictoryÂ® and Indian MotorcycleÂ® and SlingshotÂ® brands. Additionally, Polaris continues to invest in the global on-road small electric/hybrid powered vehicle industry with Global Electric Motorcars (GEM), Goupil Industrie SA, Aixam Mega S.A.S., and internally developed vehicles. Polaris enhances the riding experience with a complete line of Polaris Engineered Parts, Accessories and Apparel, Klim branded apparel and ORV accessories under the KolpinÂ®, Cycle CountryÂ® and Pro ArmorÂ® brands. Polaris Industries Inc. trades on the New York Stock Exchange under the symbol "PII", and the Company is included in the S&P Mid-Cap 400 stock price index. Cody Crocker and co-driver Greg Folleta on route during the 2014 Finke Desert Rally.